Growing up, my brother Paul was good at baseball, my brother Chris was good at math, and I was good at eating. I don't mean I ate a lot (which I did). I mean I was a skilled eater. I could eat a big bowl of spaghetti without splashing my top with gravy. Every time. I could rearrange the components of a New England boiled dinner on my plate so that you would swear I had eaten virtually all of it, when in fact, I hadn't even touched it. Some families would show off their kids at a violin or dance recital, my parents would invite people over to watch me eat an artichoke. By age six, I was a virtuoso artichoke eater. It was a performance I had mastered like no other. Whenever we had artichokes, I would be wiping the last drop of lemony juice from my lips, while all of the adults at the table were still hacking and picking at the outer leaves. Even my athletically gifted older brother was clueless when it came to the heart. Dumb jock. I could scrape the meaty pulp off of each leaf with mechanical precision, losing not a bit of the nutritious flesh, and never getting a prickly fiber stuck in my teeth. I became compelled to teach the artichoke-challenged. It was a rewarding yet frustrating few years for me. I remember walking into the kitchen one Sunday afternoon, while a full audience waited in the dining room, only to discover my artichoke had been overcooked by my mom. I remember slamming pan covers and screaming, as I stomped around the kitchen, "Al dente! I said al dente!" I was an artichoke diva. My mother, unlike most stage mothers, remained calm and settled me down. I shook it off, took my place at the head of the table, and proceeded to give another flawless Sunday matinee performance. Before making this recipe, please read: Artichokes 101: How to Clean, Cook, and Eat an Artichoke. It has step-by-step photos. This recipe was originally published on this blog last spring. But it's so good that it's worth repeating. There are many ways to enjoy artichokes, but none is as deliciously satisfying as Italian stuffed artichokes. Artichokes double in size when the leaves are stuffed with olive-oil soaked Italian bread, olives, pine nuts, cheese, and herbs. Keep in mind that you may need slightly more or less stuffing depending on the size of your artichokes and on the amount of stuffing you use in the leaves. Also, the larger the artichoke, the longer the cooking time. Stuffed artichokes are labor and time-intensive to make but are oh-so-worth-it. 1. To make the stuffing, cut stale bread into a few thick slices and moisten with warm water, just enough to soften but not soak it. If it's too wet, then squeeze it dry with your hands. Tear the bread into small pieces (about 1/2 inch), and place in a large bowl. 2. Meanwhile place an artichoke on a cutting board and cut off the stem. 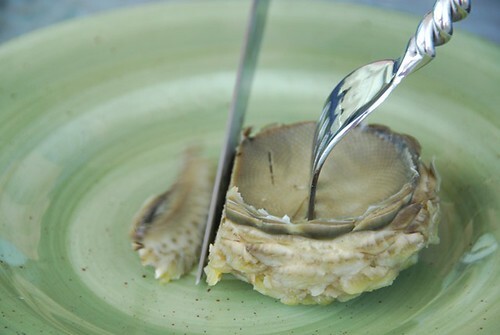 Using a sharp knife, remove the fibrous outer part of the stem and discard. Cut the remaining center of the stem into long, thin strips, then dice. Saute in a small skillet with 1 teaspoon olive oil until lightly browned. Add to the bowl of bread. Add 1 tablespoon extra-virgin olive oil, chopped olives, crushed red pepper flakes, parsley, basil and cheese and mix well. 3. To toast the pine nuts, place in a small dry skillet over medium heat for 1 to 2 minutes, or until golden brown. Shake the pan handle gently to ensure even toasting. Add to the bowl of bread and season generously with salt. 4. Mix the stuffing well with your hands, breaking up any large pieces of bread. If it seems too dry or crumbly, add a little more olive oil or water. If it's too moist, add a bit more bread. I usually taste it at this point and adjust the seasonings as necessary. (If making the stuffing ahead, then place in an air-tight container and store in the refrigerator up to 3 days). 5. To clean the artichokes, cut off about 1 inch from the top of the artichoke and discard. Using a pair of kitchen shears, trim off the tips of the remaining leaves, until they are straight across. Rub the leaves all over with a lemon half. 6. Using your thumbs, gently separate the leaves (the fresher the artichoke, the tighter the leaves). Pull out the purple-tipped, pointy leaves from the center and several surrounding yellow leaves until you reach the fuzzy choke. Using a small spoon, scoop out the fuzzy choke until the cavity is smooth. Then squeeze some lemon juice inside the cavity to keep it from oxidizing, or turning brown. Repeat with second artichoke. 7. To stuff the artichokes, begin by placing 2 to 3 tablespoonfuls of stuffing into the cavity of each artichoke to prevent the leaves from closing up over it. Then using your hands, fill each leaf with about 1/2 to 1 teaspoon of stuffing, starting at the outermost leaves and working your way toward the center. Try not to overstuff the leaves early on, in case you run out of stuffing by the time you get to the second artichoke. You can always go back and add more. 8. To cook the artichokes, use a large, deep saucepan and fill it with 3 inches of water. Add a whole sliced lemon and 1 tablespoon extra-virgin olive oil to the water. Place stuffed artichokes in the pan close together so they remain upright. Drizzle each with one teaspoon of extra-virgin olive oil. Cover tightly with a lid and bring to a boil for 10 minutes. Then lower the heat to a simmer, keeping the pan partially covered, and cook for 40 to 60 minutes, or until leaves are tender. 9. 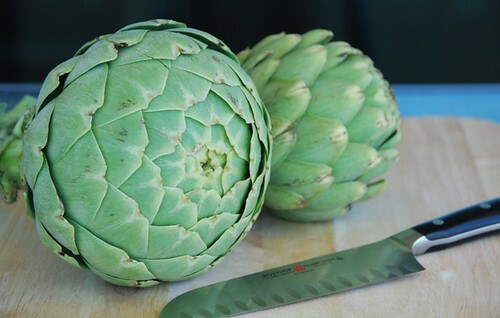 To check for doneness, try pulling a leaf from the artichoke, it should come out easily. Too much tugging means it needs to cook more. You can also insert a long, thin knife into the center of the artichoke; it should easily go through to the heart. Lift the knife straight out so you don't cut the heart. Transfer cooked artichokes to a large plate or shallow bowl and let cool for 5 minutes before eating. Artichokes can also be kept warm by loosely covering with foil and eating within 15 to 20 minutes. I ADORE stuffed artichokes. I make them every Easter and Christmas, but they never look this good! This looks too-good-to-be-believed. My stomach is rumbling! Oh, and your eating skills? Spectacular! This recipe looks insane. Is it wrong to eat one for breakfast? Don't want to anger the diva! The story is hilarious. I love, "Al dente! Al dente!" Thanks for the laugh. A very nice story, Susan. Stuffed artichokes are one of the joys of the table. Love your photos too. Oh my word, Susan! I'm in complete awe. :-) Your diva-ish-ness cracks me up! 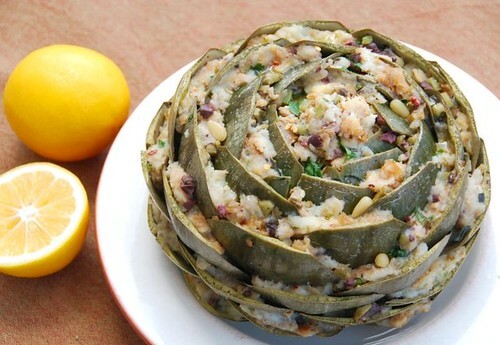 :-) I've never ever had a stuffed artichoke but wow, this is fantastic! Beautiful stuffed artichoke! I'd love to taste that dish! Bwahaha, hilarious. Great photo too, the first one - looks amazing. This is how my mom always stuffed our artichokes and to this day, they remain one of my favorite things that I have ever eaten. I would love to see your performance sometime. It seems Grammy-worthy. I'm 28 and I still have trouble making it through a meal without getting something on my shirt! What is your secret? I've never heard of stuffing artichokes. I can't wait to try this one! holy moly that looks obscene! I've never seen such perfectly stuffed artichokes. They're one of my favorite springtime treats. I love artichokes, though I lack the patience to stuff them as beautifully as you have done. I don't remember when I had my first artichoke -- maybe some time in high school? -- but I've been a huge fan ever since. I LOVE artichokes and no one in my home does. and I fail to understand how anyone can not like an artichoke. Susan I have never seen a prettier stuffed artichoke!! Can I invite myself over? You are way too sweet to have EVER been a brat! Yet the 'al dente' part certainly made me giggle. One of these days I'm going to give whole artichokes a try! first of all, great read--i've never known an artichoke diva. :) secondly, i've also never known how to disassemble an artichoke, so that's good to learn! finally, your dish looks amazing--most impressive, susan! I've got a 'choke in the fridge right now. Love your story - you're hilarious. This sounds amazing. Do you know if rubbing with a lime also prevents oxidation? wow, this looks lovely! i've never seen one stuffed like that; i will have to try it! Great (and funny) post Susan. The photos are top notch too. And the recipe is definitely worth repeating! Stuffed artichoke! That looks really...awesome. You're so good with your artichokes! I'm a simple, artichoke lover... just like them steamed (al dente) with a little mayo. I've never tried stuffing them in any sort of way, but your way looks delicious! Sounds like a fantastic performance! And, that is one huge artichoke. It looks beautiful with the stuffing. i never really tried artichokes but that looks mighty good! Good goddess that is beautiful. Bellissima. Switch out the breadcrumbs for gluten-free and I am so there. You Diva, you. Wow, I wish I could get mine to look like this, but never the less they are delish!!! I don't often leave comments. But I had to say something about this stuffed artichoke. I have never seen an artichoke so perfect in all my life. You have totally inspired me to make some this week. I'll let you know how they turn out. THANK YOU! jessica-How sweet of you. Thanks! simona-Thank you so much, my dear. rambling-I'm glad it made you laugh. sasasunakku-You just made me smile too. melanie-You've got to have a stuffed artichoke. Seriously. Like now. linda-They are the essence of spring for me. lydia-It's easy to fall in love with them. soma-Absolutely! They're big enough to share. cara-I'm sure they will with you as their mom. kevin-Hope you're gonna eat it soon. anonymous-It should since the acid oxidizes it. I use limes on avocados and fruit for that purpose. Although I don't think I'd like the flavor with chokes as much as lemon. brie-I really hope you do. jenni-You have no idea how happy that makes me. I love when young children are introduced to more unusual and healthy foods. Way to go, Mom! joowonahn-I can't help you there, but I do hope you find some. mary-I asked on Twitter and FB for you but haven't gotten anything yet. Artichoke leaves have an earthy almost grassy flavor. The heart is tender and nutty. It's unique. I hope you find some. I really do. mrpineapple-Well, what are you waiting for? They're amazing! Your story from your childhood cracked me up! :) Thanks for sharing! My dear artichoke diva, that is the most amazing artichoke I've ever seen. You've opened up my artichoke horizons. If we went toe to toe in a "rearranging food on the plate to simulate actual consumption" competition, I think I could give you a run for your money. My wife and I made your stuffed artichokes today. First time for us. They were amazing. Not as big as the ones you get in Calif. but really good. We'll be making them again. Thanks for the recipe. This is a thing of beauty.... it's been far (far) too long since I've had a stuffed artichoke -- though I'm by no means a pro, I'm definitely determined!